Portland is a wonderful city at Christmas, even if we don’t get much snow. Our city has a little something for everyone, like walking the SE neighborhood street Peacock Lane to see the beautifully lit houses, bundling up for the train ride at Zoo Lights, or driving the Portland International Raceway track to see the lights of Winter Wonderland. This year we are excited to add something new to the mix – the Radio City Christmas Spectacular featuring the world-famous Rockettes. This new touring production is constructed for large-scale venues like the Rose Garden, replicating the Christmas Spectacular production playing New York’s Radio City Music Hall. The 90 minute show is enchanting and beautiful, both from the set design and digital scenery on an 80 ft. LED screen, and the singing and dancing. One thing we immediately appreciated was the show’s sense of timeless tradition and elegance. There are no ridiculously overblown light shows or frenetically paced dance numbers. 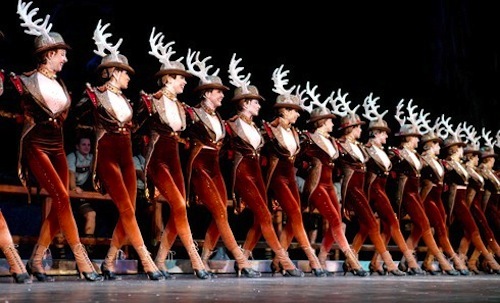 Each vignette of dancing or storytelling is introduced by Santa, beginning with his entrance on stage in his sleigh pulled by Rockette reindeer. Our favorite performances include New York at Christmas, the glittering costumes in the closing number, and something special with a company of Santas that you have to see for yourself. The Radio City Christmas Spectacular really appeals to the entire family. Our twelve year old daughter didn’t feel like she was ‘too cool’ for the production, and our three and nine year olds left the production kicking and dancing their way out of the Rose Garden. The way the production is staged, you don’t have to be right up front to enjoy it – a little perspective actually helps you take in the sheer scale of this show. If you have family members on the fence about going, I’d heartily recommend showing them the tour’s promotional video. It only hints at how amazing the show really is. Radio City Christmas Spectacular is simply a delightful evening of entertainment that appeals to a wide age group. It’s got something for everyone in the family and is a welcome addition to the holiday line up. Radio City Christmas Spectacular runs December 23-26 at the Rose Garden Arena. Tickets range from $25-99 and can be purchased online or at the Rose Quarter box office.